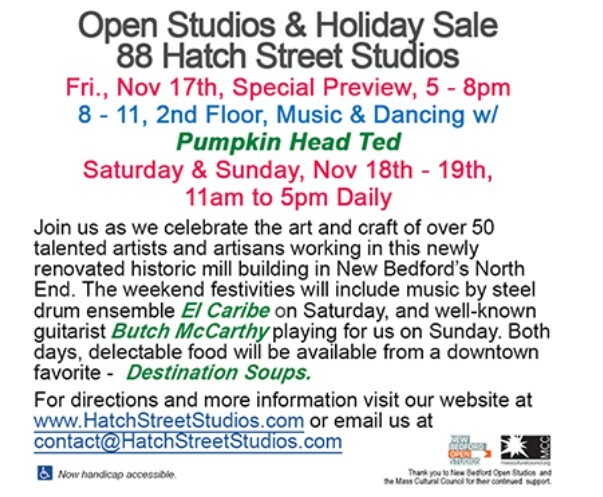 Hatch Street Studios, New Bedford’s largest artist community, is pleased to announce their annual Open Studios / Holiday Sale 2017. This three-day celebration, popular with art lovers from the Southcoast and the entire New England region for more than 10 years running, offers a look into the professional spaces of 60+ artists working in a restored 19th-century textile mill. Visitors are invited to view the studios, discover their creative processes, and purchase original works of art in a wide variety of media including ceramics, jewelry, photography, wood, glass, painting, and textiles. The festivities begin on Friday, November 17 from 5 to 8 p.m. We continue throughout the weekend from 11 a.m. to 5 p.m., with live music on Saturday by steel drum ensemble El Caribe and on Sunday by guitarist Butch McCarthy. Food service will be available all weekend by Destination Soups. The event is free and open to the public, with plenty of free parking and handicapped accessibility.